​Imagine trying to jump a course with a three-year-old child on your back. A child whose legs and arms are snugly in contact with your body, and who seems to know exactly how to balance her weight as you run and jump? ​​A child who holds on with a death grip and always seems to be ahead or behind your movement? ​A child whose grip is so loosey-goosey that her legs and body slide around so she pulls you off balance at every step? Unless you are masochist, that was a rhetorical question. Your horse would prefer you to be snugly in contact with his barrel, balanced just so as he flies over the jump, and following his neck and head movement with your hands as he jumps and canters. You can buy every gadget, try every bit, make liberal use of your crop, work your horse over cavelletti and jumps until you are both so sour that neither of you wants to enter an arena again. But none of that will matter unless your body and the horse's body are working in unison. That requires communication between horse and rider. And that requires equitation—which essentially is what dressage is called in the hunter-jumper world. A stable and effective body position allows you to communicate and influence your horse AND to respond instantly to whatever the horse is telling you. Kursinski describes a stable and secure seat this way: The ideal rider position is like a deeply rooted tree with a strong, solid base supporting free-flowing branches—your legs and seat being the trunk and upper body and arms and hands being the branches. It’s a position to be maintained regardless of what the horse is doing. It needs to be flexible enough to go with the horse when called for yet strong enough to withstand the horse’s tendency to try to pull you into a less effective position. ​Dressage emphasizes an effective body position that allows you to communicate and influence your horse AND to respond instantly to whatever the horse is telling you. It all starts with steady, relaxed breathing. “Horses know more about us than we think they do, and our breathing tells them a lot about what’s going on with us," Kursinski notes. One exercise that Kursinski emphasizes is shoulder-in. She describes it as the go-to exercise for getting a horse to round his frame naturally. 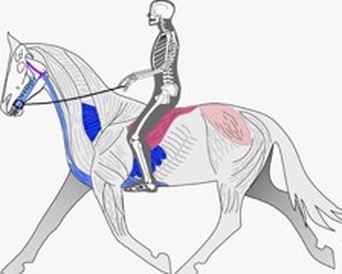 The problem is that many riders believe shoulder-in means cranking the horse's neck toward the inside of the arena. It doesn't. “Done right, the horse has to use his back and hind legs, which will make him naturally round", she points out. 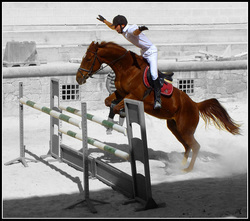 "It’s not about pulling his head down.” The effectiveness of shoulder-in is that it establishes a connection between inside leg and outside rein. “Used properly, this is like yoga or Pilates for horses,” she notes. I would add that shoulder-in is a fairly advanced exercise that should not be attempted right off the bat. Instead, it is better to start with shoulder-fore and leg-yielding, then advance to shoulder-in. Your horse will thank you for it.